I don’t celebrate Christmas, so there was never going to be any sort of Christmas paper doll from me though I have enjoyed other’s forays into that genre. But I do celebrate the New Year in traditional style which is to say, I get together with friends and party. I wanted to draw some party dresses for Curves and that meant sketching a pair of short flirty dresses. Though I must confess openly, that the dress on the left (with the puffed top) is not the most flattering thing I have ever drawn for Curves. Of course, I suspect it wouldn’t be that flattering on anyone. In other website news, I’m excited to offer a preview of something coming starting in January. I’ll be starting a new paper doll series and here is a little preview of what they’ll be looking like. 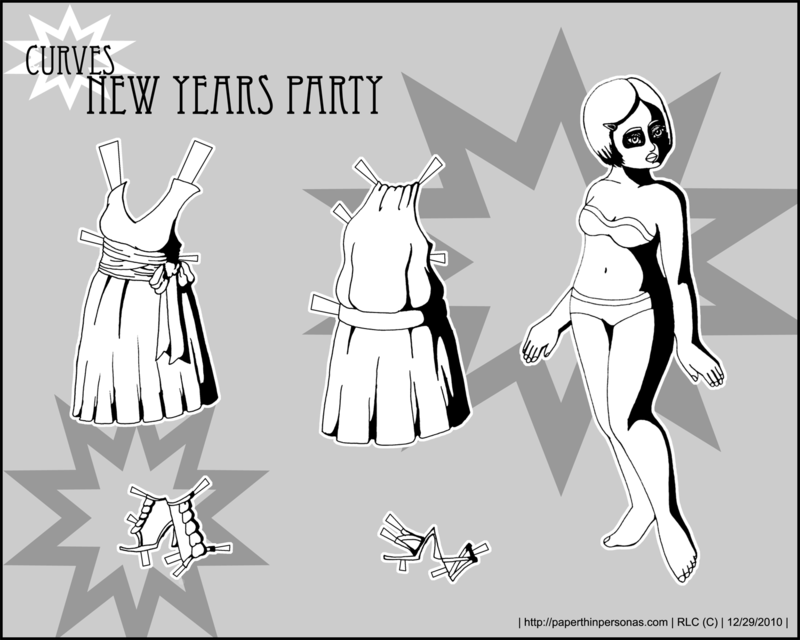 So, you can expect a new full color printable paper doll set starting January 2nd, which is a Sunday for those who are counting. Oh, and as long as you’re here, why not vote in the poll on the sidebar and help decide the future layout of this little corner of the web? I like the shoes on the left. They look pretty.